Lotus led the way with the Cosworth DFV. Literally! The 'Double Four Valve' V8 would become legendary within F1. Unfortunately for Lotus, the DFV engine was also available to their rivals! They were quick to seize upon the source of Lotus' success. By the end of the '60s, it seemed like every car in the paddock had a DFV! That was great for the sport, as it fostered close, competitive racing. It was not entirely to Lotus' liking, however! They had acquired a taste for leading F1 ... and the ubiquity of the DFV was eroding that lead. Something had to be done about that! There was much about the Lotus '72' that was new. For starters, its cigar-shaped bodywork had morphed into a wedge. Inboard suspension and brakes made the new car yet more aerodynamic. They also served to reduce unsprung weight. The springing itself was via torsion-bar. High grip levels were the much-coveted result of all this innovation. Oil and water radiators were laterally positioned - thus centralising weight distribution, and improving handling. Lotus had the lead back! Jochen Rindt duly won four races on the spin. Tragically, that was before crashing in qualifying for the Italian GP. Fatally injured, he still won the World Championship - so dominant had he been, up to that point! Team-mate Emerson Fittipaldi also took the drivers' title - though, mercifully, he was still around to take the plaudits. Also in a Lotus, Ronnie Peterson would amass a record-breaking nine pole positions in a season. 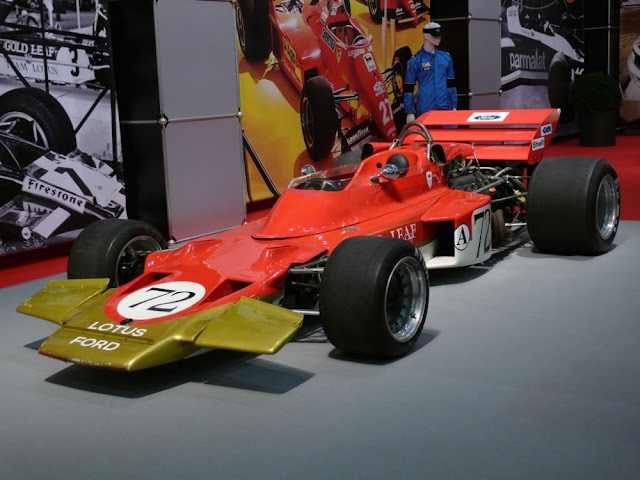 From 1970 to '75, Lotus ruled the F1 roost. Their early adoption of the Cosworth DFV had paid huge dividends!